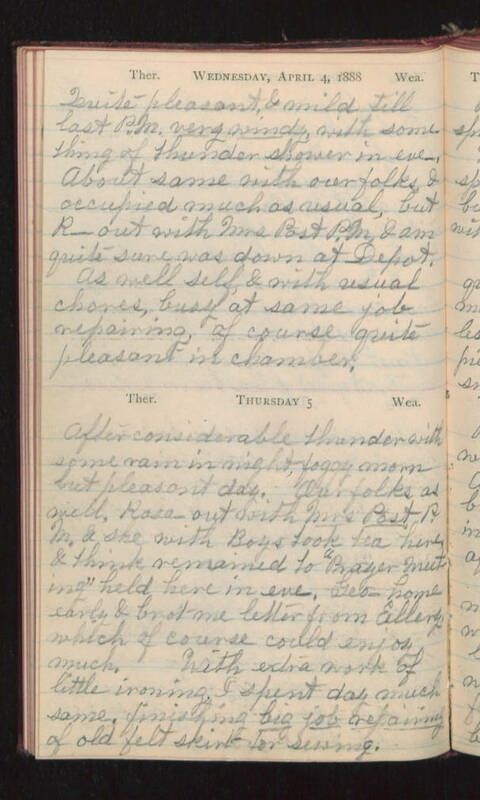 Wednesday, April 4, 1888 Quite pleasant, & mild till last P.M. very windy, with some thing of Thunder shower in eve. About same with our folks, & occupied much as usual, but R- out with Mrs Post P.M. & am quite sure was down at Depot. As well self, & with usual chores, busy at same job repairing, of course quite pleasant in chamber. Thursday 5 After considerable Thunder with some rain in night, foggy morn but pleasant day. Our folks as well, Rosa- out with Mrs Post P.M. & she with Boys took tea here, & think remained to "Prayer Meeting" held here in eve. Geo- home early & brot me letter from Ellery, which of course could enjoy much. With extra work of little ironing I spent day much same, finishing big job repairing of old felt skirt for sewing.